Open a Word Document to answer the following questions. Go to Anatomy Notes and draw and lable a diagram of the respiratory system. Use the website below to access the answer for the following questions. 1. After watching the intro (replay if needed) select continuous breathing. a. What happens to the rib cage during inhalation? b. What happens to the diaphragm during inhalation? c. What happens to the rib cage during exhalation? d. What happens to the diaphragm during exhalation? 2. Go to “Take a closer look” After watching the introductory material, answer the following. f. What is the blood that is coming from the heart dropping off at the alveoli? g. What is the blood picking up and carrying back to the heart? 3. Use the website below to answer the following questions. a. What is meant by gas exchange? b. What happens to air in the nose? c. What is the epiglottis and what does it do? d. What are the cilia and what do they do? f. What happens to the particles trapped by the cilia? g. Why is your left lung smaller than your right lung? i. What do the capillaries around the air sacs do? j. 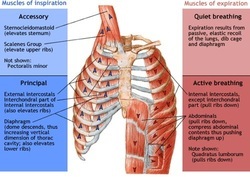 What are four muscle groups involved in breathing? k. Make a T-Chart comparing inhalation and exhalation. Write facts about what occurs during each process. l. Where is the respiratory center for controlling breathing located? m. Describe at least three things that can change your breathing rate? n. Describe the four locations for the sensors that control breathing rate. a. Describe the features of alveoli that adapt them for effecient gas exchange? external intercostal muscles, the diaphragm, and abdominal muscles.